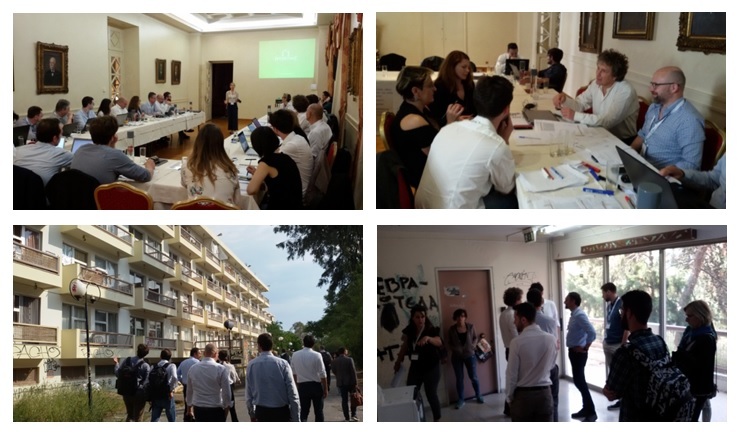 During 8-10th May, ProGETonE partners met for their third General Project Meeting, hosted to excellence by the National and Kapodistrian University of Athens. The meeting in the beautiful historic buildings of University of Athens in the City Centre was marked by intensive and fruitful discussions about the integration of energy solutions (passive and active systems) into the new external structure that allows increasing building seismic safety. Important decisions were made concerning for example the adoption of the “box-system” approach, enabling maximum flexibility to implement several options of the abacus in the renovation process and easing future upgradings towards balconies, sun-spaces or room extensions. The challenges concerning the centralised/decentralised or mixed Integration of HVAC Systems were analysed in detail and further steps decided to find the optimum solution in terms of cost-benefit, environmentally, economically and socially. The site visit to ProGETonE’s main pilot project, a students’ residence in the NKUA Campus in Athens, gave a perfect overview of the number of parametres and specific situations to be taken into account. Main technical proposals and social approaches were discussed, facing the challenges concerning the existing balconies and the installation of ventilation and climate equipment among others, while social challenges deal with the space need from students and the users’ involvement, taking into consideration that it is a changing community with no current attachment to the building. During the meeting, synergies with two other European projects were established: representatives from Zero-Plus and More-Connect consortias shared with ProGETonE partners questions and experiences about data protection and modular deep renovation strategies.